When 3 Disciples opened their Santa Rosa taproom in the midst of SF Beer Week and the Pliny release this February, after brewing for two years in quiet, rural seclusion in Sebastopol, they quickly learned that the holy trinity for craft brew fans is the I, the P, and the A. The "disciples" theme is a fun homage to the brewing traditions of Trappist monks, says head brewer James Claus, who founded the brewery with friends Matthew Penpraze and Luke Melo. Claus fell in love with the Belgian "abbey" beers at the source, while backpacking in 2005. "And I like that they're not for everyone," says Claus, who joined the Sonoma Beerocrats homebrewing club and was a disciple of the late Byron Burch, founder of The Beverage People fermentation supply. The style was developed by monks who for centuries lived nominally ascetic, monastic lives of prayer, contemplation and work—much of that work being brewing strong beer, and not a little contemplation probably following drinking said beer. 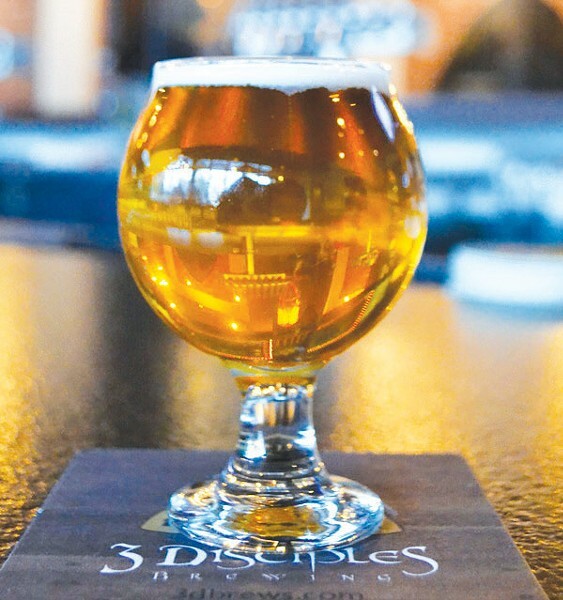 3 Disciples began their measured commercial rollout in 2016 with a sort of farm-to-kettle brewery on property with a small hop yard and a lemon tree that provides zest to the light, estery saison-style Sleight of Hand. The brewery won four top awards at the 2018 Battle of the Brews for their European-inspired Zet Magic and barrel-aged Lunar Halo, but when they finally opened the doors to their taproom, in the remodeled former Chrome Lotus nightclub, thirsty pilgrims promptly drained the place of their IPAs, which they scrambled to resupply. The space behind the bar goes on for days, and Claus hopes to fill it throughout the week with live music, pub trivia and community events. Coming up: a fundraiser for flood-affected Crooked Goat. The house style here is pronounced, with malty character at a minimum. Even the "American tripel" Solar Halo is deceptively light, with hints of white raisin; and the bright, citrusy IPA slate culminates in the Pulp Fission juicy DIPA, a wallop of Meyer lemon and Mandarin orange that's accomplished with hops and brewing style. My growler choice: the floral, hop-forward Alpha Gypsy double IPA. There are no in-betweener ambers here, but directly to the dark stuff—Claus' other obsession is stouts and porters. Kona Mocha is brewed with Kona coffee and vanilla, but gets a hint of chocolate from Kiawe pods. Heavy on black patent malt, the roasty Lunar Halo is an amped-up imperial Irish stout, and surely rewards further study and contemplation. 3 Disciples Brewing, 501 Mendocino Ave., Santa Rosa. Sunday noon–9pm; Monday–Thursday 2–10pm (closed Tuesday); Friday 1–11pm, Saturday noon–11pm. 707.978.2459. Very merry pinot Making wine from the heart. When I first met wine pioneer Merry Edwards, we were in Montana at the Resort at Paws Up, where she was the featured honoree for a weekend of wine dinners. At the first of two dinners, I tasted an irresistible first course of scallops and a main dish of sea bass that set the stage for the guest of honor's barrel-fermented sauvignon blanc, aka liquid white diamonds. Edwards led us through her history of winemaking from 2009 to 2014 and spoke of challenges like "grape sunburn" and the evolution of taste as wines age. That was almost two years ago, when she shared her dream of being featured on the cover of Wine Spectator Magazine. Her dream may very well come true, especially with the news she has sold her winery to the Louis Roederer Champagne house. Her brand, its inventory and the Sebastopol winery and tasting room are included in the deal: six vineyards that total 79 acres. From what I learned about Edwards, this deal is akin to giving up her children for adoption. I know this because when we departed Montana, we spent the better part of a two-hour layover in Seattle, where I listened to her story, beginning with why she is so fascinated with pinot noir. "When I went to UC Davis in the '70s, nobody talked about pinot in America," she said. "Everybody was all about tasting Bordeaux. That's all you tasted in this school . . . people like cabernet, merlot—Bordeaux because they're big and hit you in the face. They're not sophisticated like pinot noir or like Burgundy." She continued, "Imagine me at [age] 26, arriving at Mt. Eden, a tiny winery in the hills above San Jose. They had a 25-year-old pinot noir vineyard and happened to have this unknown clone of pinot I later took to the university (UC Davis) for cleanup. Now we had our own clone 37. Phenomenal. It was pure luck I wound up there. I had pinot and an old vineyard already. And I had cabernet, merlot and chardonnay. But I was so fascinated by the pinot. I love this wine; I fell in love." 1. She was born in Boston, Mass., in Newton Highlands. Her father attended school at MIT and during the war performed research (he was diabetic). By the time she turned five, the family moved to Michigan. It wasn't until Edwards was 13 that the family moved to California. 2. She believes each of her vineyards creates a personality from its location and soil. She says, "Depending on what rootstocks and clones I choose, that creates a unique profile, and in my mind it becomes part of my family." She has an emotional connection to her vineyards, so much so that she named them after herself and her loved ones, including her husband Ken and her late son, Warren. 3. Edwards' primary fan base comprises sommeliers of the country, who she believes have totally different palates from wine reviewers. Of the sommeliers, she says, "They're the ones who guide the restaurants, and where I formed my first partnership." 4. Each year, Edwards opens 10 vintages. Whichever ones are performing well are what she'll release to her club members. She can do this because she keeps 10 cases of every single-vineyard wine so she can put together a collection of six and release 126 packs. 5. She has never had the inclination to produce merlot, which she considers a difficult varietal. 6. She once wrote the introduction to one of Karen McNeil's wine books. 7. If she weren't a winemaker, she wanted to be a veterinarian. 8. She considers sauvignon blanc one of the two great white wines of the world. She says, "A lot of guys who don't like white wine in general like my sauvignon blanc because it's got body. You can feel it in your mouth." 9. She uses watch glasses to cover Riedel glassware to contain the aromas during a tasting, and she does not believe in outdoor tasting rooms because the aromas go into the atmosphere. 10. Edwards has never tried to emulate French wines and considers herself California-centric. "I am not really a fan of Burgundy," she says. "I'm totally California oriented. I'm a complete American. I don't emulate the French. I don't look to the French for guidance ... I'm not about copying anybody. A lot of winemakers thought they had to follow the French, and if your wine didn't taste like a Burgundy then you had no place, your wine wasn't valid. That's crazy. We don't have the same conditions as the French. You follow your own heart, your own terroir. Make the wine from your heart and don't worry about what anyone else is doing."